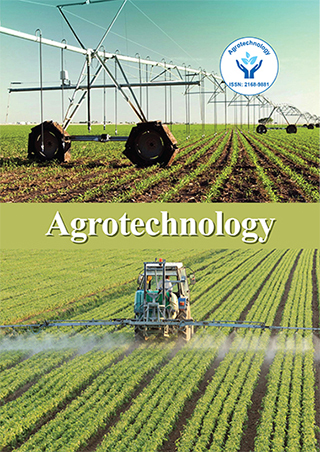 The level of Cry1AC protein in roots and soil planted with Bt cotton (Mech 162 +Bt) was assessed during the cropping sea - son as well as after harvest of total crop. Quantification of Bt endotoxin by ELISA technique in different temporal growth phase of Bt cotton unveiled a clear pattern. Level of endotoxin in the root samples was as 0.55 μg/g in tap roots followed by 0.25 μg/g in fine roots at late flowering stage (150 Days after sowing). The concentration of the toxin in fine roots reached upto 0.34 μg/g at the maturity phase (165 Days after sowing) and it remained almost stable upto 247 days. In the earlier stages of the crop (vegetative to flowering stage), there was no detection of the Bt toxin in soil. However, in the late flowering stage (120 Days after sowing), a concentration of 0.0012 μg/g Cry 1Ac toxin was detected in the soil which increased exponentially to 0.0033 μg/g in 195 Days after sowing and then remained almost stable till 247 Days after sowing. These findings suggest that the Cry1Ac protein gets passively released through the tap roots and fine roots from standing crop and can persist in rhizospheric soil even after the crop harvest upto a considerable time and this persistency is of great concern in relation to its probable effects on below ground biodiversity especially soil microbes. Namita Rani Das is presently working as Assistant Professor in Central University of Bihar, India. She has completed Ph.D. degree from IARI, New Delhi. She has been awarded JRF from ICAR for M.Sc. and JRF from UGC and SRF from IARI for Ph.D. She is member of Indian Science Congress Association and Soil Conservation Society of India. She has guided 5 M.Sc. students and Guiding 3 M.Sc. student. She has published about 6 research papers in International and National journal, 1 popular article, 1 book chapter and 3 seminar abstracts. She is presently engaged in research on environmental biotechnology, algal fuel and heavy metal bioremediation.